A first for the young football program of my alma mater, South Florida: a bowl game win. They defeated East Carolina 24-7, largely by dint of a superb defense. Freshman QB Matt Grothe played very well in the first half, but was forced out by a blow to the shin late in the second quarter. Senior Pat Julmiste, whom Grothe had dislodged as starter early in the season, did yeoman service in the second half. Though the Bulls did not add to the 24 points they had gotten early, Julmiste directed an effective ball control game, relying largely on the running of Benjamin Williams. This meant the defense could get some rest, which paid off when the Pirates failed to score either, despite several incursions of the USF red zone. One of the commentators remarked that some publication has already put together a pre-season college fotball top 25 for 2007, and that South Florida is its number 25. I probably put less stock in this than most people would. Still, it's possible to imagine them going to something a bit more prestigious than the Papa John's Bowl next year. Update: Todd Wright of Sporting News has a piece on the "worst bowl names ever", and Papa John's is the first mentioned (though with the observation that it is far from the worst). Wright saves my favorite, the Poulan Weed-Eater Independence Bowl, for the final graf of his article. 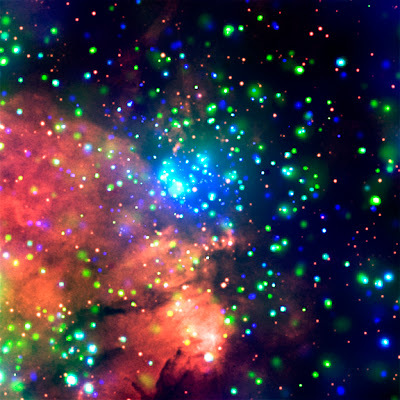 This Christmas tree light-like display is an image of one of our galaxy's centers of new star formation, called W3. It was made by Harvard's and NASA's orbiting Chandra X-Ray Observatory (see here) (named for the great astrophysicist Subrahmanyan Chandrasekhar), and the image was downloaded from Alan Boyle's splendid Cosmic Log, on MSNBC. Mr. "You're fired!" shows his forgiving side, and Tara keeps her tiara. 12.20 extry: The Daily News's perhaps inevitable page 2-3 banner today: "Teary Tara to Keep Her Tiara". On page one, she's called "Queen of Denial". If you're not familiar with the word I've used to head this post, and there's no reason why you should be if you haven't spent some time on the Louisiana or Mississippi Gulf Coast, the definition is here. It's interesting to see its etymology, coming to Creole French via Spanish, but having its origin in the Native American Quechua language. Anyway, I've used it to head this post because this is a season for gift-giving, and I'd like to use this post as a way of sharing a few things that I hope will make your season brighter. First, you may remember that, a month ago, I recommended and linked to a blog called The Goat Rope (see here). Being caught up in pre-holiday stuff, I've been neglecting my blog and failing to keep up with some of my favorites. On looking into El Cabrero's latest offerings, I was delighted to see a series of posts (here, here, here, here and here) in which, responding to a reader's challenge, he gives his vision of a just society. I find little to fault in E.C. 's prescriptions; to find areas where we disagree, you need to go back to an earlier series of posts to which he links in his discussion, particularly this one (yes, I'm sort of taking the side of Denny Dimwit). I mean to write what I hope will serve as a well-thought-out response to E.C. 's series once life calms down a bit. For now, suffice it to say I think that, in some areas, I'm a little less conservative and perhaps a bit more optimistic than he is. within ourselves to bring to life.